Dressed in a hi-vis vest and rugged up in a coat despite the late spring day, I join a busload of punters, in the true sense of the word, on a tour of Flemington. Apart from the 40 or so of us, and staff and delivery men, we almost have the famous Melbourne racetrack to ourselves. It’s the day before Melbourne Cup and everything seems in order; tables and chairs laid out on the lawns, roses blooming and drinks chilling in fridges at the swish marquees in the Bird Cage enclosure. There’s an absence of horses but we stop for photos at Phar Lap’s statue (which is 10 per cent larger than the mighty chestnut gelding himself) outside the Heritage Centre and gaze in admiration at the statue of Makybe Diva, who won three successive Melbourne Cups from 2003 to become the highest stakes-earner in Australian racing history. She had gleaned $14 million by the time she retired in late 2005. This is a Behind the Scenes tour and the first of its kind offered to P&O Cruises passengers. An hour earlier we’d disembarked the Pacific Explorer at Melbourne’s Station Pier. I’m not a big fan of racing, but I find the tour fascinating and appreciate the privileged access. We view the mounting yard, the empty horse stalls and move indoors to see the old-world Toledo Jockey scales. Then our guide pushes open a door and I feel I have entered a Lilliputian world. I look around at rows of lockers and chairs, and stare quizzically at what I believe are a pair of rather cute black-and-red patent leather kids’ boots. Next to them is a matching red saddle. Everything here is tiny. Morning tea is included in the tour and just when I think it can’t get any more interesting or fun, we are shepherded into another room and out a door to the premium viewing Lawn Stand. We are told to line up and hand our cameras to another hi-vis wearing official, who takes our photos – one by one – in front of the beautiful wrought-iron arch that leads onto the track itself while holding the 18-carat gold $200,000, 2017 Melbourne Cup itself. It’s a pinch-me moment – the ultimate selfie. This is certainly the high to finish on and we’re all pretty happy as we’re bundled onto the bus back to the ship. P&O has been sending punters to the Cup ever since Orcades III set sail from Sydney Harbour in 1969. However, 2017 was the first year it offered the pre-race Flemington tour. This year, some 6000 passengers will cruise to the Melbourne Cup with P&O. Pacific Explorer and Pacific Eden will depart from Sydney on November 3 for a six-night cruise. Pacific Dawn will depart Brisbane on November 2 for a seven night cruise. Sister company’s ship Carnival Spirit will also sally forth, departing Sydney on November 4, so passengers can attend Oaks Day (or Ladies’ Day) on November 8. Most passengers pack their finery – frocks and hats or fascinators for the women and a suit for the men, although there’s always a scallywag who likes to don the fancy dress, be it shorts, top hat and tails or some other crazy combo. Ships are decked out in bunting and the entertainment is non-stop: there are talks and Q&As with Cup-winning trainers, owners and jockeys, horseflesh tips by the score, a phantom race call by a well-known commentator, a packed-house fashion show and fascinator-making classes, not to mention the big race itself on November 6. Sheila Laxon, the first woman to train the winner of the “cup doubles” – the Caulfield Cup and Melbourne Cup – with her horse Ethereal, in 2001, is returning this year to appear on both Pacific Eden (as the ship heads south) and on Pacific Explorer (on its return leg to Sydney). Laxon had us on the edge of our seats last year as she relayed her three near-death experiences – two involving horses and the other a treacherous plane ride. Her most serious, a fall while riding in 1991, left her in a coma for eight days. It took her two years to learn to walk again. Also on board both the Explorer and Eden this year is jockey John Letts, who rode Cup Winners Piping Lane (1972) and Beldale Ball (1980), while trackwork rider Joe Agresta, who rode for trainer Bart Cummings for 34 years, will share his stories while on board both the Pacific Dawn and the Explorer. 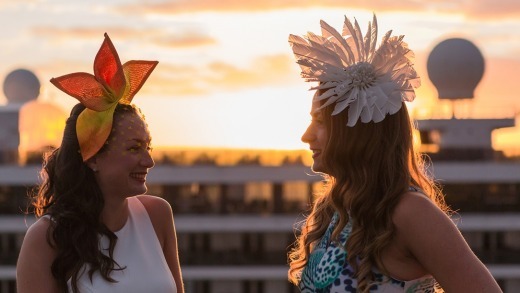 While talking about horseflesh and reliving great moments at Flemington certainly draws passengers into the ships’ auditoriums, the big event (for women, usually) is the P&O Fashions at Sea, held on each ship the day before the Cup. Our small group couldn’t find a seat last year and the aisles were packed. So here’s one tip that’s a definite winner – get there early and hang on to your seat! Over the years, celebrities and TV personalities, including Nicky Buckley, have presented the parade, which is a mix of fashions from designers and brands such as Leona Edmiston, Allanah Hill, Swarovski and Sportscraft. The audience can also join in, with both ladies and gents parading their best outfits and vying for prizes. This year, P&O is championing diversity and has chosen Brisbane-born model Madeline Stuart to open the fashion show on Pacific Explorer. Stuart, 21, is the world’s first professional adult model with Down Syndrome and has appeared on the catwalks of Paris, London and New York during their respective fashion weeks. Her manager and mother, Rosanne Stuart, will also be on board and partake in a Q&A about her daughter’s rise to fame in the past two years and how she is changing society’s perceptions about people with disabilities. The fashion shows are produced by Australian stylist Fernando Barraza and choreographed by dancer Ame Delves. As to the race itself, the cruise fare includes transfers to the track and back and a general admission ticket. 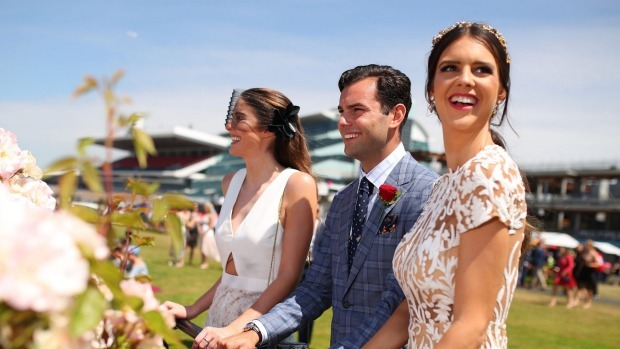 There are opportunities to upgrade with several packages, from the affordable $149 Lawn Stand seat opposite the winning post up to wining and dining options that cost up to $1386 a person. Those confident of backing several winners on the day might like to mix and mingle with some of their fellow passengers in the exclusive P&O enclosure, where grazing on finger food and plenty of drinks – and a Lawn Stand seat – are all part of the deal. The enclosure has comfy seats, big screens and bookies as well. The ride back to the ship at the end of the day tends to be fun or fraught (and usually a little boozy). Even if money has been lost, there are still another three nights on the ship to kick back and have fun, eat up and be entertained. Those travelling on the flagship Explorer will be treated to a show by X Factor Australia duo Jess & Matt. Those who want to have more of a gamble can hit the casino or gird their loins and go zip-lining. Six-night P&O cruises departing Sydney are priced from $899 (Pacific Explorer) and $999 (Pacific Eden) a person in a four-person cabin. The seven-night cruise on Pacific Dawn from Brisbane is priced from $1036 a person in a four-person cabin. Bookings before October 2, 2018, receive P&O’s 85th birthday offer: pay an $85 deposit and receive $85 a cabin to spend onboard, plus a gift pack of towel, cap and bag.